The recent launches of iOS 8 brought a critical bug to Dino Rush : saving config (preferences, progress, items unlocked, coins earned) does not work. We have been working hard to identify the issue and fix it. Apple has eventually approved the new version. 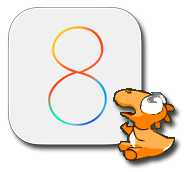 If your iDevice is running on iOS 8 you should update to Dino Rush 1.9 as soon as possible. If you are not, you can safely skip this update.